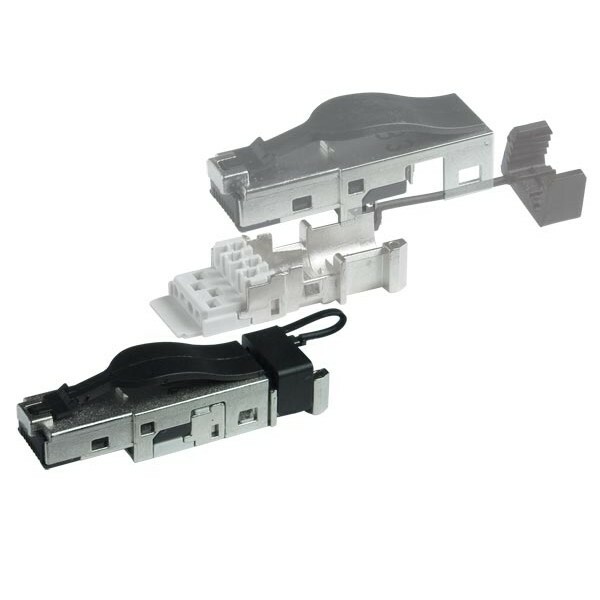 RJ45 plug for larger diameter CAT6 round cable. Supports Gigabit Ethernet (1000Base-T) transfer rates. Accepts large cable diameters of 0.217"-0.334". For Stranded or Solid Conductors. 360 degrees of zinc die-cast metal shielding protects signals from external noise. How to: assembly is quick and easy, simply press together with your fingers or with the Parallel Crimp Tool. Presorted wire loading bar allows easy handling, just slide in the wires to the color-coded spaces. Perfect for use with CAT6-BULK-STP-color-NPC and CAT6-BULK-STP-PLNM-GRAY-NPC to create patch cords. 1000ft 23AWG CAT6 250MHz STP Solid, Larger Diameter, In-Wall Rated (CM), Bulk Ethernet Bare Copper Cable - Blue.